Aflac Incorporated is a U.S. insurance provider. Since December 1999, the company's commercials have featured the Aflac Duck, who "frustratedly quacks the company's name to unsuspecting prospective policyholders". For eleven years the Duck was voiced by comedian Gilbert Gottfried, until Aflac fired him last month after he made jokes about the T?hoku earthquake and tsunami on his Twitter account. Since then, Aflac has sought a new voice for the Duck, and on Monday and Tuesday 650 people auditioned in Atlanta, Austin, Chicago, Las Vegas, Los Angeles, and New York. 11,200 additional video and audio auditions were accepted on quackaflac.com, a website set up for the search. Aflac executives hope to have chosen a winner in about a month's time. The new voice will be paid in the low six figures. Those are the dumbest commercials. They should have taken this opportunity to come up with a new ad campaign instead of keeping up the same worn-out stuff. Japan to Gottfried: "DUCK OFF!" 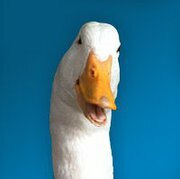 Remember Gadfried: When your jokes hurt and you can't work, Aflac insurance will cover expenses that other insurance won't. Gottfried should know, as a professional comedian, that comedy equals tragedy times time. Obviously, the Permian mass extinctions are the funniest thing ever. That sounds like a good forum sig. Just letting you know I'm gonna use that and credit you.